What started off as an email to family and friends, quickly became apparent to me that it needed to be a blog. I can't keep blogging like life is full of lollipops and cotton candy fields, while hard and heartbreaking things are happening around us. I doubt I need to go into the tragedy of last week's Boston marathon...Oh and then there's Texas :( Blarg. Granted, there are always blessings and lovely instances that I choose to cherish and praise God for- and it's those things that I have decided (for the time being) to focus on here at Sweet Lavender Bake Shoppe. But honestly you guys, sometimes I need to get really real. Sometimes it's ok to mourn and cry, and then bind together in loving prayer. My heart is so very much hurting right now and my mind has been elsewhere for the last few months. It is with gentleness and heaviness that I come to you all. About 6-7 months ago my husband and I heard some tragic news about a dear friend. Friends, my sweet girl Stephanie Jones, has cancer. Bad cancer (not that there is EVER a good kind)- but if you were given a choice of cancer to get- this would be the one you definitely WOULDN'T choose. It's violent. It's aggressive. It's nasty and mean and just plain lame. It won't go away, it won't die, and it won't listen to any of the chemo she's had. I hate it with my whole heart and I don't want to lose her. Stephanie is my age, married (almost 5 years) to a lovely man, and has 3 kids (whom she home-schools). Two babies are still in diapers! She lives a healthy life- ate right, chose organic/healthy foods, drank filtered water, wore sunscreen, exercised, hugged friends, went to the dentist yearly, payed her taxes...yet cancer still found her. Blarg. Because of the type and strength she has, her chances for survival are slim. There are very particular things she needs to have done and QUICKLY in order to live through this. She's been in and out of a few hospitals since her diagnosis last year, and all have included lengthy (exhausting, for her) car trips (sometimes 3x a week! ), painful bone marrow biopsies, transfusions, blood work, long (kid-less) stays (I mean, like weeks and weeks), chemo, and what have you. A few weeks ago though, the doctors found out the chemo just wasn't working anymore. So, needing to work fast (because her AML is incredibly aggressive), they sent her to another hospital in hopes their super powerful mega chemo would do the trick. She lived again in the hospital, for another week or so. More bone marrow biopsies, more chemo, more blood work, more sickness and more pain. It didn't help. Her cancer came back, again. They advised her to stay another few months in the hospital, for more chemo, and to best keep from any germs she might come into contact with (the chemo completely depletes her immune system) until her hopeful bone marrow transplant surgery...whenever that would happen. Which means, she wouldn't be able to see her kids, or any germy friends/family the entire time. Ugh. She bravely, and with confidence in Christ, chose to go home, orally take her chemo there, be with her family, and take the risk. So, what this means is her survival rests solely on a successful bone marrow transplant (and a quick one at that) and the hope that she can remain germ free at home, during that wait. The last chemo (although not 100%) did indeed reduce her cancer cells dramatically- to the point where the doctors are happy and see her transplant surgery as a safe "go". Amazingly, Stephanie found out she had not 1, but two potential bone marrow donors! Both were also, hallelujah, a perfect match- 10/10! A few days after hearing the good news, we found out donor #1 would be on vacation the day the doctors needed to do her surgery. Poo. So we rested and waited on the news from donor #2. If their schedules conflicted with the doctor's, we'd all be back to square one. God is so good. The timing was perfect. Donor #2 could do it and is scheduled to donate healthy bone marrow for my friend. We are all, so very much, praising God for the blessings and miracles we've all witnessed along the way! He continues to show us all that He is indeed there, right beside them, right beside her, and with each and every one of us who cries out for that family. For example, even though she can't have her kids with her during these lengthy stays, her hubbie has been able to stay in the room and live there along side her, each and every time. Every single night. (I wish I could show you a hilarious picture she sent me of his "super comfy" hospital bed! It was priceless! He is about 100 feet tall, while the bed was around 5 feet, haha.) Needless to say, senses of humor are also at an all-time high over here ;) Laughing is good medicine. Also, their parents have been able to care for their kids every single time they've had to stay in the hospital. When her bone marrow biopsies were just too painful, the doctors were able to start doing them with her completely asleep! Her husband has been able to take an extended leave from work so that he can care for Stephanie and their kids whenever the two of them are back living at home! Also, their church congregation has banded together and made an account just for the Jones's financial help! A portion of their tithes go straight to them! Phew! You guys, God is so good. So here we are now. Again praising God for His mercy and grace. Loving Him for the time she had and still has! And we're so hopeful! Her surgery is scheduled for April 29th and she will be in that hospital for the following 2 months. Yes her husband will be there, but her sweet babies will not be able to visit. Kids = Germs, and Germs are NOT welcome around someone with a depleted immune system. That news is hard for Tyler and Stephanie- they adore their kids and miss them tremendously when they're not around..
Tyler will have to wear a mask the entire time and only 100% healthy friends will be able to visit... through glass. So where do you come in? Right now. Friends, I need you all to bind together and PRAY. You guys, prayer is SO POWERFUL. It's such a faithful and beautiful way to communicate with our Heavenly Father. He listens to us and responds to the cry of those who reverence Him (Psalm 34:15, 145:19)! He delights to hear the prayer of the upright, which accomplishes much (Proverbs 15:8, James 5:16) and is near to those who call upon Him in truth (Psalm 145:18). So let's lift our sister up to him, shall we? Please please, join us over here in this neck of the woods, and continuously lift my sweet friend up in your prayers. We are believers in Jesus. We believe in His goodness and kindness, His perfect love, His will be done on Earth as it is in Heaven, and His ability (should He choose) to heal Stephanie. So we have all (since the horrid news) joined Stephanie and Tyler in their prayers for her miraculous healing, strength, peace and comfort. Please pray for the doctors- that they are able to accurately do the transplant surgery with little OR NO complications! Pray that this surgery is a complete success. She needs it to be, to even stand a chance. Pray for Tyler and Stephanie's extended family- that they are helped and supported (especially with all the kids) during this time. Pray for the donor and his/her family and friends. Pray that they are blessed for their immense selflessness. Pray for their church- that they would be blessed for their generosity and that the financial help continues to come. Pray for Stephanie's cancer- that His will is for it to be removed, once and for all. Pray for her body, for her healing, for her blood, her bone marrow, her immune system...her anxiety, their time in the hospital afterwards, for everything. Please bond with us all, as the prayer warriors we need to be, and pray unceasingly for this sweet girl. 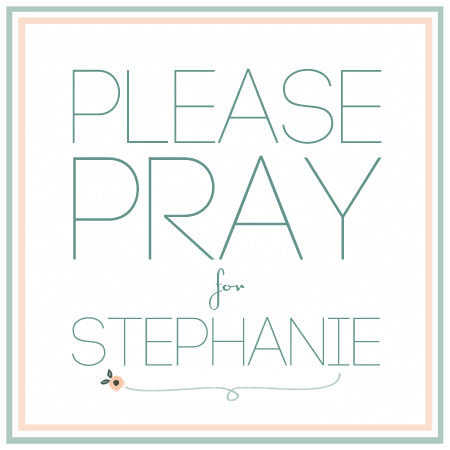 Please friend, please pray for my friend Stephanie. PS- I just have to say, so neat- this song was playing the whole time (came on by itself on my Pandora when I first started, and I just kept it on a loop the entire time!) Praise God! Stephanie and Tyler are now back to Donor #1 (#2 had an unexpected illness) and their new admission date is May 12th for pre-surgery chemo treatments. The new surgery/transplant is scheduled for May 23rd. "My last bone marrow biopsy showed my cancer was back at 80%. It hasn't moved to my blood yet and that's a good thing, but it moves quickly and my doctors are no longer hopeful. Please continue to pray for all of us. I check in the 12th for the chemo, radiation, and transplant (transplant is the 23rd). And please pray I have the energy to enjoy my family the next two weeks before admission. We still aren't going to let this get us down! Shoots, when you think about it, "worst case" I'll be in Heaven. Isn't that our best case?" Praying right now for your friend!! For complete healing and strength, as well as peace and strength for her loved ones!!! God will definitely strengthen,heal her and will provide everything she needs. God will surely bless her with many miracles that you asked to our Lord Jesus Christ. them.We ask all this in Jesus Mighty Name, Amen. Praying! Please keep us all posted on her condition. Praying! Please keep us posted on her condition. Praying so very hard my dear sweet friend.